and further excerpts from the „Visions of Labor“ project. Bärbel Schönafinger is the initiator of the Internet-based project kanalB, which has developed from a platform for anarchical video-making to a non-commercial distribution pool for political documentary films. The activities of the network are often associated with grassroots campaigns. 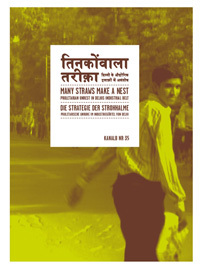 Die Strategie der Strohhalme (Many straws make a nest) is about the extreme exploitation of workers in Greater New Delhi and their resistance. The documentary is part of the project, “Visions of Labor,” which Bärbel Schönafinger will present using further video excerpts. As “carte blanche” she will show Marta Rodríguez’ and Jorge Silva’s classic Chircales (1972), which documents the relation between disenfranchised labor and poverty using the example of Colombian brick workers.